Do you remember ‘The Gong Show’? It was kind of the ‘American Idol’ of the late ’70’s, early ’80’s with one major difference. Just imagine Jennifer Lopez, Keith Urban and Harry Connick Jr. listening to each contestant and then instead of simply deciding whether or not they would earn a golden ticket, they would decide if the contestant would be allowed to complete their audition or if they were so absolutely horrible that one of the judges simply couldn’t stand it any longer and must pick up a big stick and strike it on a giant ‘gong’. The only benefit of this method that I can see is that the sound of that gong reverberating through the room would help to drown out the cries of those eliminated contestants. When I was in 4th grade, some moron unwise administrator decided that instead of our regular yearly talent show, our school would have it’s very own version of ‘The Gong Show’. Yep. My friends and I just knew that all of those months singing along to Cyndi Lauper’s ‘Girls Just Wanna Have Fun’ were finally going to pay off! We practiced our routine every single day after school and perfected our choreography. The big day arrived and as we pulled on our lace fingerless gloves, multiple strands of long bead necklaces, flouncy skirts and two pairs of different colored socks, we felt the anticipation building. Finally it was our turn. As we marched out onto that stage, filled with confidence, we turned to get a look at the judges. There sitting behind the table were other students. And not just any other students. These were the ‘popular’ kids. The ones who seemed to sail effortlessly through life and had multiple pairs of Guess jeans. These were our judges. I think we all knew in that moment that this wasn’t going to go well. But it was too late to turn back now. We got into our positions on the stage, gave a nod to the kid in charge of the record player and as we heard Cyndi Lauper belting out those first few lines and began our routine, we found ourselves forgetting everything else besides embodying the very essence of those enviable girls who just wanna have fun. It lasted all of about one minute. As we were dancing our little hearts out, I saw the movement out of the corner of my eye. Then the tell-tale sound of the scraping of a metal chair across the floor as it was being pushed away from the table. One of the ‘judges’ stood up and as the audience went crazy with a combination of booing and cheering (and as we still danced and lip-synched), they walked over to the cymbal/gong and gave it a hearty whack. And just like that, my extremely short-lived career as a Cyndi Lauper impersonator was over. But something happened to me that day. It may have looked like I simply walked off that stage with my head hanging down and my side ponytail looking deflated. the gong came with me. In fact, the sound of that gong continued to follow me throughout most of my life. And, frankly, I got to the point where I no longer needed someone else to pick up that stick and give it a whack to eliminate me. Because, well, I became perfectly capable of doing it all by myself…to myself. You’re never going to fit in. That person will never like you. It’s taken many, many years to not hear that gong resounding in my head at every turn. In fact, I think I had to have the stick pried right out of my hands as my fingers clutched it as tightly as possible. And it’s only been through coming to a greater understanding of how much God truly loves me that I’ve been able to release it. This has not been an easy process though. 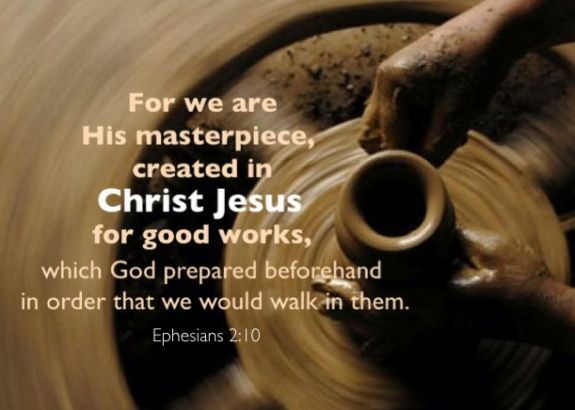 It says in Ephesians that we are His ‘masterpiece’. Think about that for a minute. A masterpiece. A thing of beauty. A work of art. Imagine a sculptor creating the most amazing statue. Pouring over the design, putting heart and soul into seeing their vision come to life, piece by piece. Stepping back and looking at it with absolute satisfaction and delight. And then watching as that creation, that masterpiece, slowly began to pick itself apart, piece by piece. Everything that you saw as beautiful, they saw as all wrong. Well that’s exactly what we do when we ‘gong’ ourselves. We’re telling God that He had to have messed up with us. We must be the exception to that ‘masterpiece’ business. But, here’s the thing, we all know that when it comes to a piece of art, it only really matters how the artist views it. Right? You know, that whole ‘beauty is in the eye of the beholder’ thing. Well, we are the ‘beauty’ and He is the ‘beholder’. So, what would happen if we began to see ourselves the way that God sees us? What if the masterpiece was able to appreciate it’s own beauty? The beauty created by it’s Master. You were created with purpose, with intention. In fact, you were made in HIS image. 22 Comments on "God Won’t Gong You"
What a perfect truth to start the New Year meditating on. I think we’ve all had similar stories that have molded our wrong thinking about ourselves and now struggle so much trying to believe otherwise. Thank you so much for sharing yours and helping us put ours into a right perspective. Boy do I remember the Gong Show!! Amen to being God’s perfect creation, sometimes it takes a while to see the truth! Thank you for todays blog, a good reminder for all. Thank you. That was beautiful. I’m sorry for your fourth grade heart that was broken. I’m happy you used it to eventually overcome and prevail. Walking with God is indeed the answer and I have found that out as well. I had similar experiences. The best news is you are using your experience and your walk to witness to others and that’s part of God’s master plan as well. Thanks for doing so, it has helped me this morning. Best to you. I can relate and how you don’t realize your putting yourself down till you are older. Thank God, for His unconditional love. I could relate so well to your words. Thanks for sharing something personal and spiritual. I think lots of us have been gonged one way or another, especially as teens – why ARE people so cruel, especially girls?!?! I’ve carried a gong around most of my life – sometimes I let go of it but all too often I pick it back up. Thanks for this extremely encouraging post that will remind me to leave the thing alone and turn to God who never gongs me!!! I LOVE this! Oh how I wish I had believed this years ago…. Believing who I am in Christ rather than looking to the world and believing the lies in my head. Great post!!!! i can’t tell you what your post meant to me this morning. I had a sleepless night “gonging” myself for the person that I wish I was and not the person that I am. It was such a blessing to wake up and read your post and be both encouraged and get some perspective. It was what I needed today. It shows me again that we are precious to God, no matter what. Thank you so much for this encouraging post! Amen, sister! Bless you for sharing this story. I can relate so vividly. Isn’t it amazing how those “gong” memories can replay in our minds? But you’re right; God will never gong us! Thank you!!! You said in one post what years of therapy has tried to teach me. I’m 64 now…how much longer must it go on? I hate the gong. Thank you!!! You said in one post what years of therapy has tried to teach me. I’m 64 now…how much longer must it go on? What a great way to start my Saturday morning! Thank you SO much for this wonderful message. I imagine all of us have had the same experience as your fourth grade “disaster”. And we all thought ours was a disaster too. Well, thank you for pointing out the truth, My Dear. And don’t ever think you deserve a gong, you are wonderful and a beautiful person inside and out. Oh wow! That just sounds so completely cruel; I can’t believe that a school administrator actually thought that was a good idea!! It really sounds like a scene right out of a movie, I can just picture it all playing out. I’m sorry you had to go through that. I think we’ve all had experiences that made us feel the same way, even those popular kids. You did a great job taking this story and turning it into something so much deeper…a lesson that every Christian woman struggles with. this is such a great message! gosh, I hated that show, I always thought it was so mean. I’m sure all you little gals were wonderful! Sad beginning, great ending, beautifully written! You’ve touched so many of us by reading the comments posted above and also have reminded us to whom we should be trying to please. Thank you for your beautiful words and thoughts. Thank you for reminding all of us just how precious we are in his sight. Have a blessed day.